Our comprehensive design, design verification, and screening capabilities provide our customers military, quasi-military and COTS (commercial off the shelf) qualified power solutions. -55°C to +125°C operating temperatures available upon request. This 750 watt military battery charger offers the ability to work off any mil 1275 source. It provides quick charging and float to 12 and 24VDC batteries, essential in military applications. This charger also offers 28VDC output at 500 watts continuous power. This compact military converter offers 37 watts of output power with an 18-36VDC input. 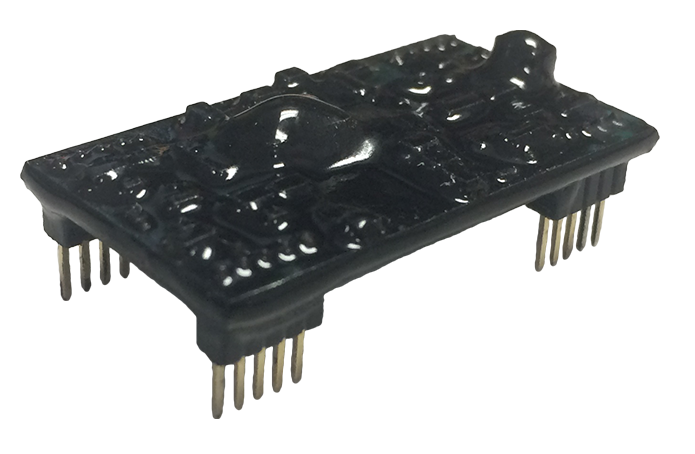 This powerful converter has 3.3VDC output at 10 amps as well as 300VDC output at 12 milliamps. This 270 watt AC-DC military desktop converters offers a 90-264VAC input as well as 24VDC output voltage. This power supply is fully compliant to FCC part 15 subpart B and is EN 60950 listed. This circuit provides an isolated primary and secondary HIGH pulse (or open collector LOW) that can be used to turn on a MOSFET or Thyristor to shut down and discharge a power supply in the event of a nuclear blast. This versatile 160 watt resonant DC-DC converter has 13 outputs to choose from. It is fully EMI compliant to mil standard 461 as well as mil standard 801. Wall custom power solutions have solved many challenging scenarios where equipment needs to serve in the desert with scorching temperatures or at sea with elements of vibration, salt air, and ocean water. In all cases, we partnered to strategize, design, and deliver power in hardened, encapsulated, and ruggedized equipment. Wall offers an array of screening options to meet both the needs set forth by military standards, and those set by individual customer requirements. With the need for ruggedized computers comes the need for ruggedized power. Wall Industries has several fully military qualified ATX style DC-DC converters for the mobile military market. 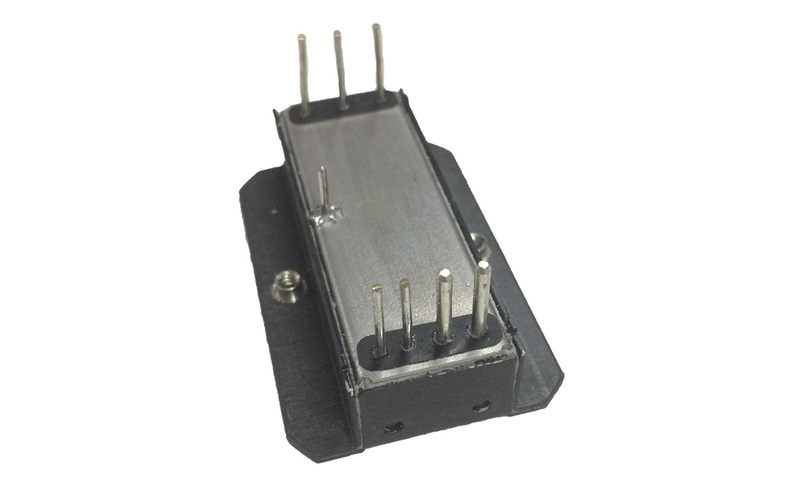 These are in form factors including VME, Brick and custom enclosures. They meet full military EMI, shock and vibration standards, as well as incorporating a nuclear event detector that shuts down the power until the event is over allowing the converter to power back up. These military grade DC-DC converters and power supplies are fully tested and qualified. Wall offers one of the most comprehensive custom product capabilities in the power converter industry, with power ranging from 1 watt to 7 kilowatts (kW) and beyond. We offer standard products: high-density designs, complete brick family: 1/8, 1/4, 1/2, and full brick. Features include 2:1 and 4:1 input ranges, high efficiencies up to 93 percent, with single and multiple outputs. Additional options include remote on/off, continuous short circuit protection, remote sense, external trim, and sync options. The United States military needs GPS units in every wheel and track vehicle. Since military vehicles are constantly roving, they require that all communication devices stay in constant current mode. In addition, military specifications require that all electronics do not generate EMI that interferes with defense operations. There is also very limited real estate in each vehicle for additional electronics. 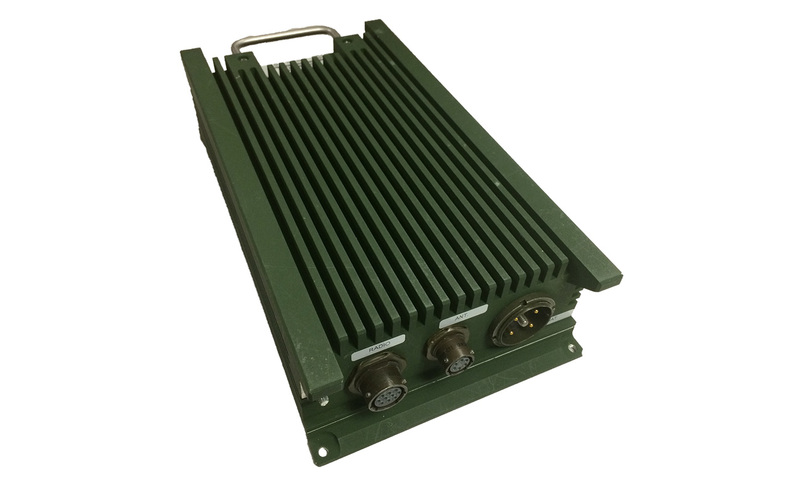 Wall Industries designed a compact power supply saving space, providing little EMI interference, and powering the GPS units providing way finding for military men and women. An important feature of this custom power supply is its ability to remain in constant current mode (always on). The device adapts to a wide variety of airborne platforms. The overall configuration provides significant platform installation and endurance benefits without sacrificing targeting system performance. This military mobile communication application required more power in a low input voltage application. No converter existed to provide power at this low a voltage. The client needed to produce a communications radio amplifier to communicate via multi-band for an inter-team radio application. Wall Industries designed a low input voltage power supply. Prior to this, the power density did not exist for this application at this input voltage level. The client was able to provide multi-band radios for mobile units. 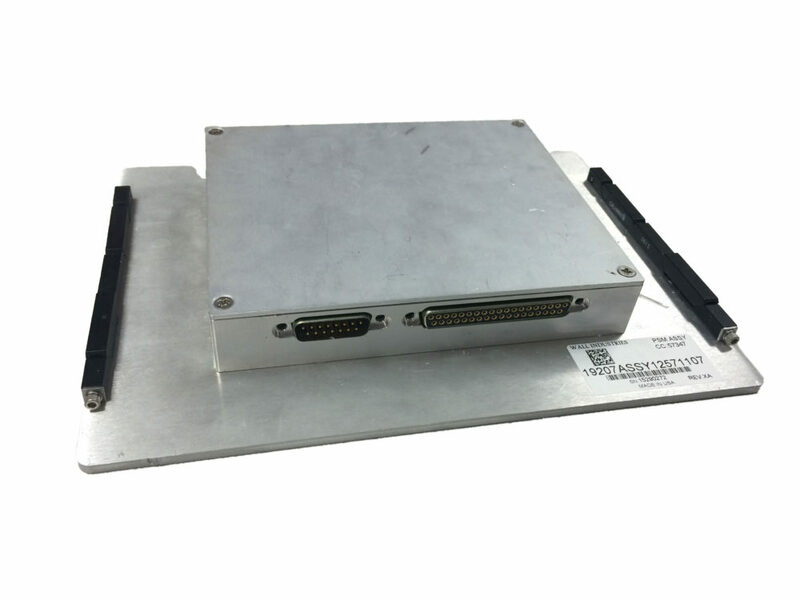 This maritime application required a custom power supply for a self-powered navigation device. These navigation systems include propulsion technology and power-generation systems for ships and submarines, control systems, shipboard launch systems and unmanned semi-autonomous systems. The two key requirements for our customization were that the power supply had to be very small and tested in a ruggedized encasement for thermal ranges. 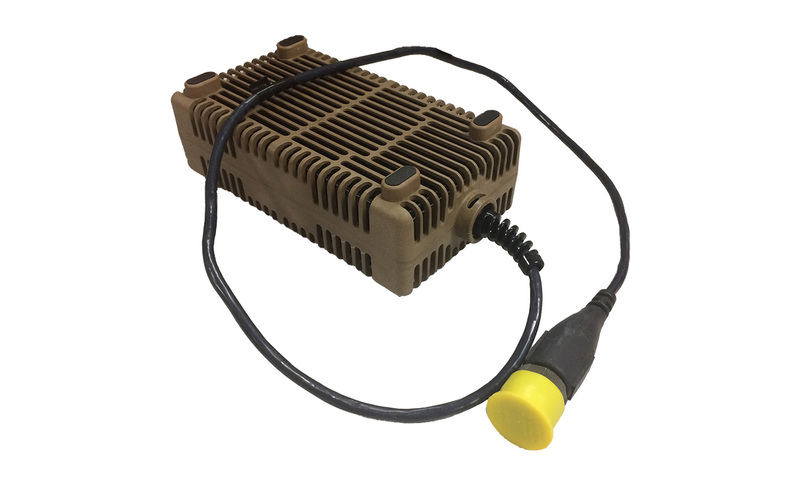 Wall Industries designed a custom power supply that scaled to their navigation system, withstood intense thermal conditions, and could fit securely inside of their ruggedized navigation equipment. This military mobile application requires a fully militarized power supply to convert 350VDC to 28VDC. The supply had to be extremely rugged due to the operating environment — specifically shock and vibration. Wall Industries designed a liquid cooled, fully redundant converter that met and passed all mil testing for the application. The custom supply was designed and prototyped to the customer in less than 4 months. Wall’s sophisticated watertight design featured a cooling plate drawing coolant directly from the vehicle radiator and dual output, 28VDC at 200 amps continuous and 14VDC at 100 amps continuous.